The objective of this MRes is to provide a cutting-edge interdisciplinary programme that attracts and trains to a high level the best students from around the world, who are interested to pursue a research career in tropical forest ecology. The aim is to provide students with high-level research training in the latest developments in tropical forest ecology, covering the physical and biological aspects of the forest ecosystem and with an emphasis on understanding the linkages between these two components. This will best prepare students for a career in tropical forest ecology research and possible PhD studies. This MRes involves a taught field course in Malaysia, and it is anticipated that students will work in a wide range of additional tropical nations for their project work. 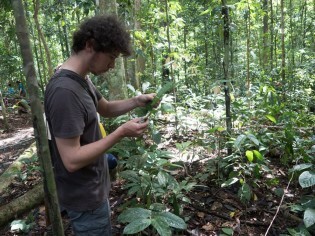 The field course will provide an opportunity for students to interact with Malaysian and international students and lecturers conducting research at the Maliau Basin Field Centre and working on one of the world’s largest ecological experiments, the Stability of Altered Forest Ecosystems (SAFE) Project. Training on the field course will include working collaboratively with researchers at the SAFE Project, directly embedding you in an active global network of more than 150 researchers. External projects will further expose you to tropical forest research in an international context. We strongly encourage students to seek out international partners to work with on their projects; ensuring project work has direct relevance to national and international needs in this discipline. This course is the only postgraduate programme within the UK that focuses solely on tropical forest ecology. This programme forms part of the Grand Challenges in Ecosystems and the Environment Initiative (GCEE). The GCEE is a global hub for addressing key environmental challenges for humanity, carrying out internationally excellent science with a focus on finding solutions to these challenges in a collaborative manner, and acting as an interface between science, practitioners and policy makers. A key objective of the GCEE initiative is to train the next generation of scientists equipped to carry out the research required to address the grand challenges we have identified. This MRes will provide students with the theoretical background and practical skills to tackle these challenges in tropical forest environments. This programme is embedded within the GCEE initiative that promotes interdisciplinary research and partnerships, bringing together natural scientists, engineers, mathematicians, medics, economists and social scientists. Freshwater Science (incl. physical and biological aspects). We have talked to potential employers about the rationale behind the MRes Tropical Forest Ecology programme and its training aspirations. The response has been positive, and our programme design comes from this (such as the longer project period, the development of a range of interdisciplinary skills, and the emphasis on both technical and transferable/communications skills). The taught aspect of this course is based at Silwood Park, a postgraduate campus of Imperial College located 25 miles west of London set in 100ha of parkland. Perks of studying here can be viewed here. The programme would be ideal training for students who want to pursue a career in academic, governmental or non-governmental organisations engaged in research into tropical forest ecology, biodiversity and conservation. In these sectors employers are increasingly looking for students with real-world experience of projects, relevant research and a solid grounding in a range of academic, professional and transferable skills, which this programme will be able to offer. The course involves four months of full time teaching, a three week field course in Sabah, Malaysia and a 30 week independent research project. This course is an MRes, meaning there is no formal written examination. Assessment is by coursework (40 %) and by dissertation (60 %). Coursework may include components such as writing grant proposals, developing a product for scientific communication, and assessment during the field course will involve a taxonomy test and compile short reports. The dissertation, or project, element will be assessed for its scientific quality as a publishable research paper and for your ability to communicate the message emerging from your research. We expect a high proportion of dissertations to be of sufficient quality to allow them to be submitted for publication in peer-reviewed journals at the end of the course. For full details about the course please visit the MRes Tropical Forest Ecology prospectus page.